Cake expectations … it was delicious! “Is it really a cake? ” That’s a phrase we heard from thousands of people visiting our Welcome to the Jungle exhibit. Yes it is cake and, what’s more, it’s really delicious cake. 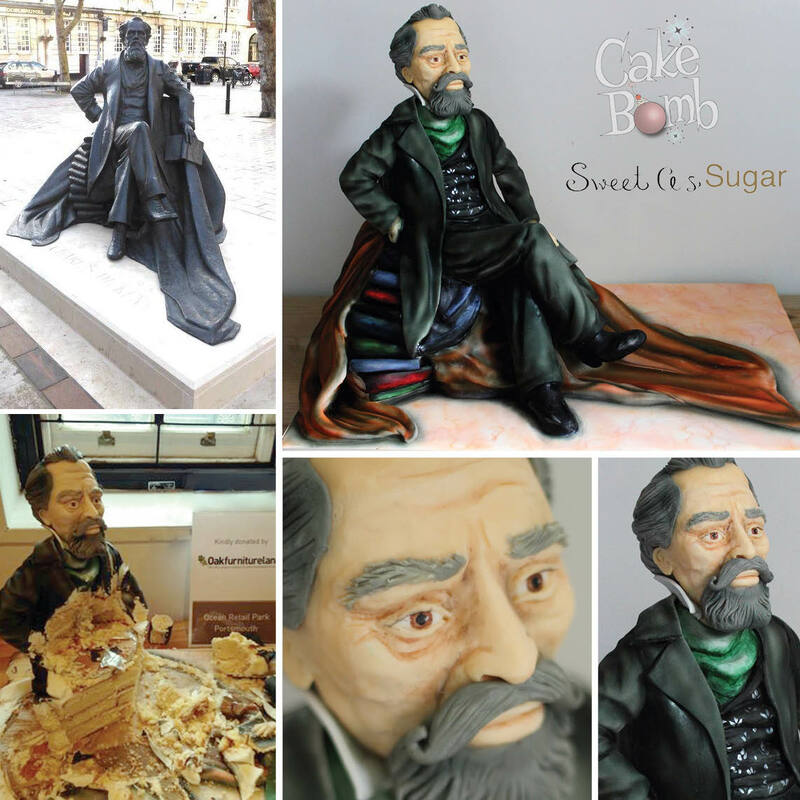 To celebrate the recent opening of their new Portsmouth store, Oak Furniture Land commissioned CakeBomb to create a cake to replicate the famous Martin Jennings statue of Charles Dickens in Portsmouth. 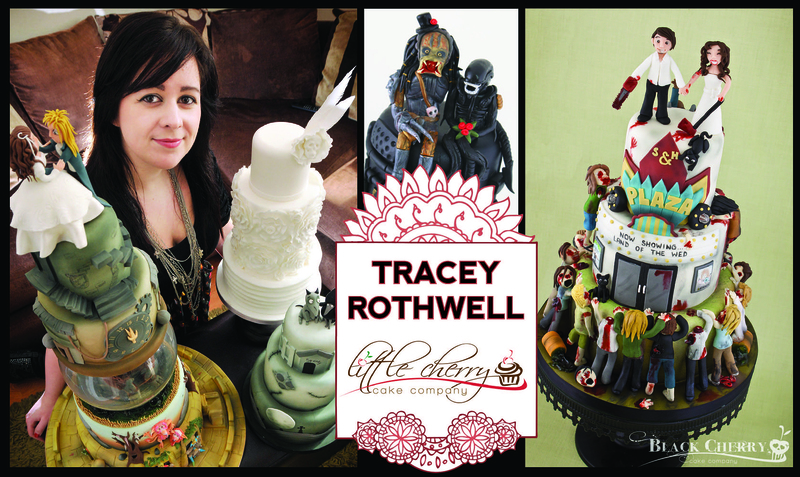 The cake artist was Laura Miller of sweetassugarcakes.co.uk. You can see it below. It was presented to Portsmouth museum, and the next day it had been demolished by staff and visitor. “A crime!” I hear you cry. Well, wouldn’t it be a crime not to eat it! We hope it was enjoyed by all. 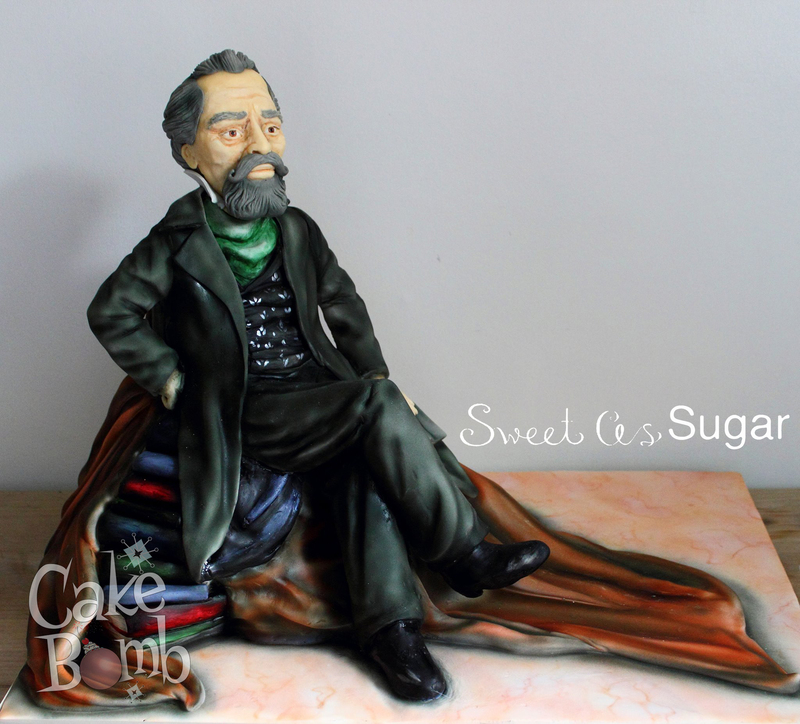 To celebrate the opening of their new Portsmouth store yesterday, Oak Furniture Land commissioned CakeBomb to create a cake of Charles Dickens. Portsmouth is the birthplace of Dickens. 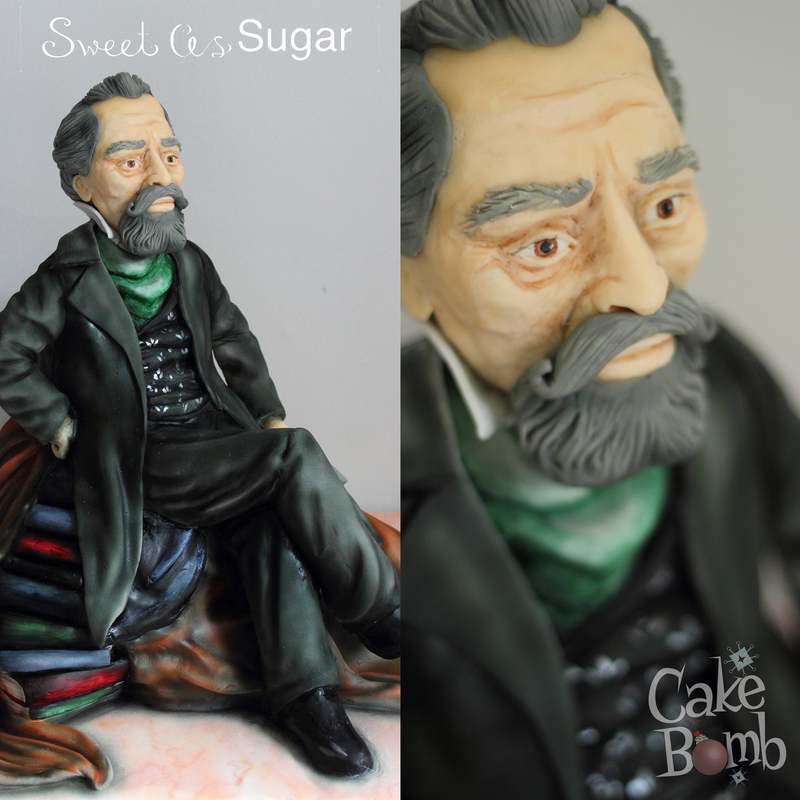 Portsmouth’s Mayor visited the opening of the new store and there was a photoshoot with artist Laura Miller of Sweet as Sugar Cakes who is responsible for this fabulous cake. 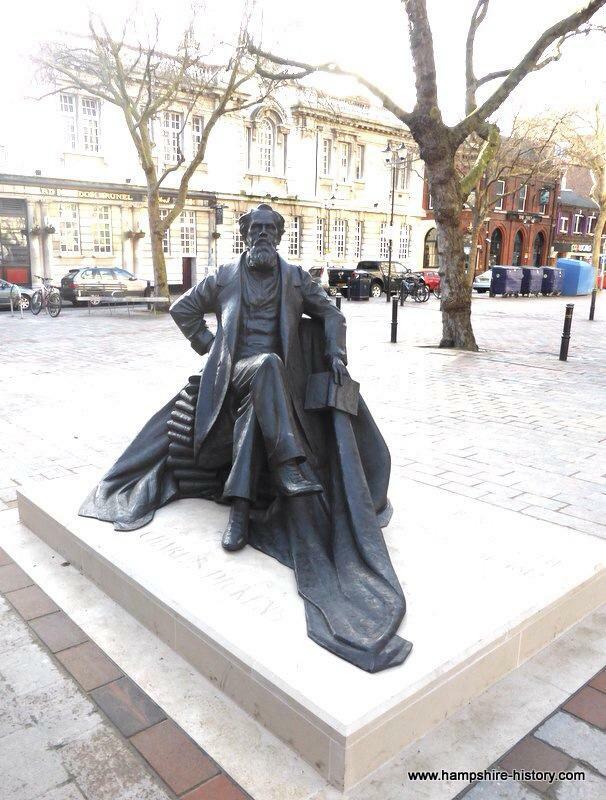 Laura really rose to the challenge to create a colour representation of the Dickens’s statue (by sculptor Martin Jennings) which sits in Guildhall Square in Portsmouth, and which was unveiled in February of this year to celebrate the 202nd year since Dickens’s birth. The cake was afterwards presented to Portsmouth Museum. We hope to show you pictures of the cake being cut later in the week. Well done, Laura, it’s a masterpiece! It wasn’t all pretty flowers and cheeky monkeys in our jungle. There were some more sinister-looking creatures lurking in the undergrowth. Photographer Paul Winch-Furness made a film of some of our other jungle dwellers. 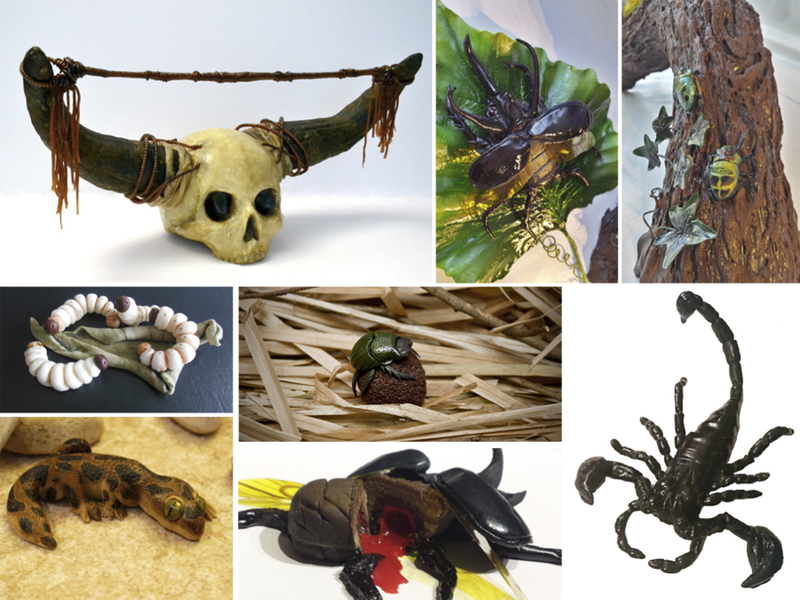 Credits: Annabel de Vetten (trophy skull, scorpion), Vicki Smith (Atlas bugs and jewel bugs), Caroline Parkin (grubs), Tracey Rothwell (Dung beetle), Beth Mottershead (gecko). Would you like to see what a great time we had in Manchester? This video beautifully sums up our experience of The Cake & Bake Show – the laughter, the tears, the sore feet, the green airbrushed fingers, the chocolate ganache and fondant everywhere, and the amazing crowds. This will give you an idea of what the atmosphere was like at the show. It just never stopped for the three days – so many people, some of them twice! The crowds were amazing; so polite, respectful and positive, and we loved meeting every single one of you. And Rosemary Shrager too – yes we do luuuuurve chocolate. Thank you very, very much to Jim Cooke for making the video. 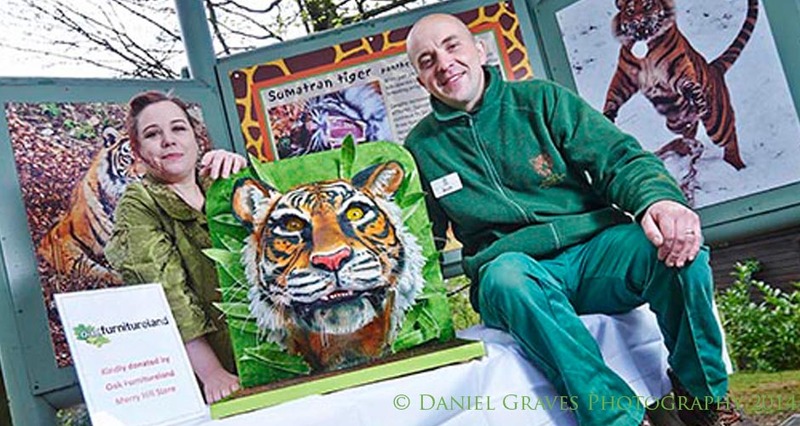 CakeBomb’s latest commission, from Oak Furniture Land, was to create a tiger cake they could donate to Dudley Zoological Gardens. Our woman in Birmingham, Annabel de Vetten of Conjurer’s Kitchen, was the obvious choice to make it. 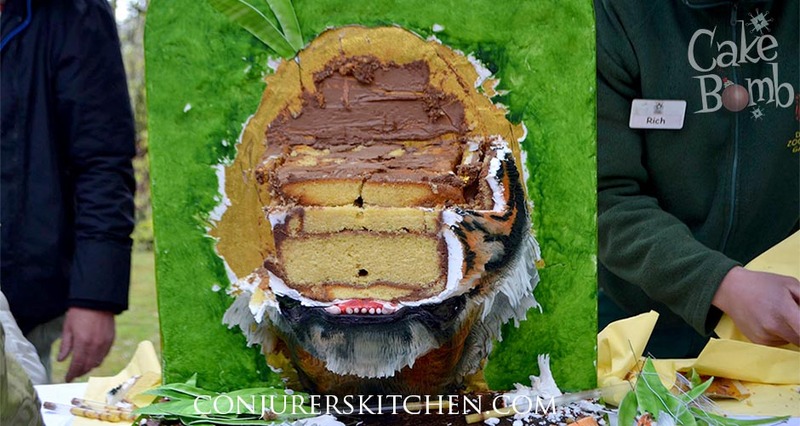 She meticulously made sure it was to scale and realistically textured – and it’s not just any tiger, this cake LOOKS like its inspiration, Daseep the Sumatran tigress, the star attraction of the zoo. The blog title – reminiscent of that Peter Greenaway film – is shamelessly stolen from a caption on Annabel’s Facebook page. She’s clever that girl. Looks like she had a fab time at the zoo. 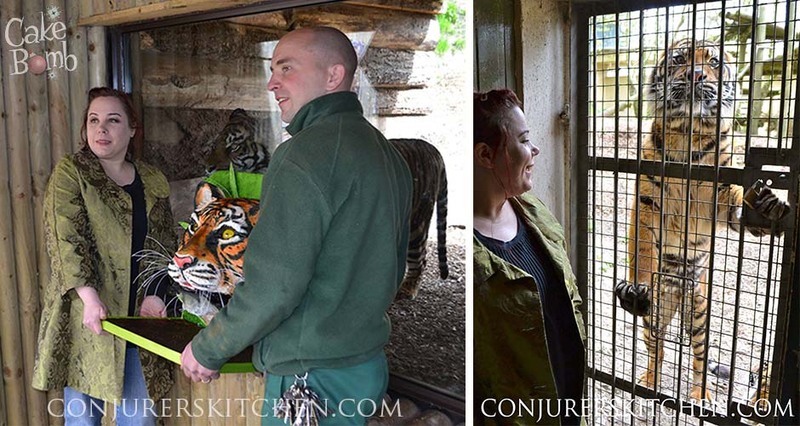 It’s not every cake delivery that includes meeting a fully grown Sumatran tigress. It is always a slightly happy-sad moment when a cake that gorgeous has to be cut – but what a shame it would be to miss out on eating delicious sponge and ganache. Looks like the public enjoyed it too! This week? Annabel Lecter is back to making “weird cakes” she says. A relief no doubt, but we certainly enjoyed her very successful foray into ferociously fluffy. Thanks to Annabel and to Daniel Graves Photography for the pictures. Annabel is pictured below with the zoo’s Assistant Curator, Richard Brown. Will the real Daseep please stand up? Did you have tea with the tiger today at Dudley Zoo? 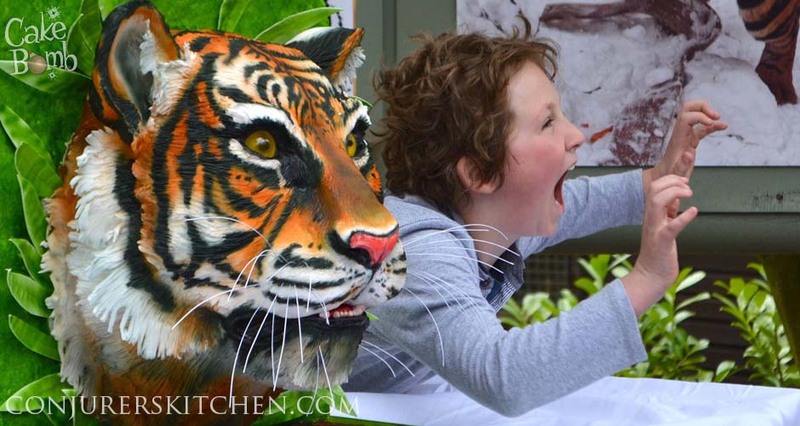 Cake artist and CakeBomber Annabel de Vetten-Peterson made this beautiful, incredibly realistic, tiger cake for Dudley Zoo this week. It was being cut at 3:15 pm today for their event Easter Tea Time with the Tigers, at the Tecton tiger enclosure. Were you one of the visitors lucky enough to get a slice? 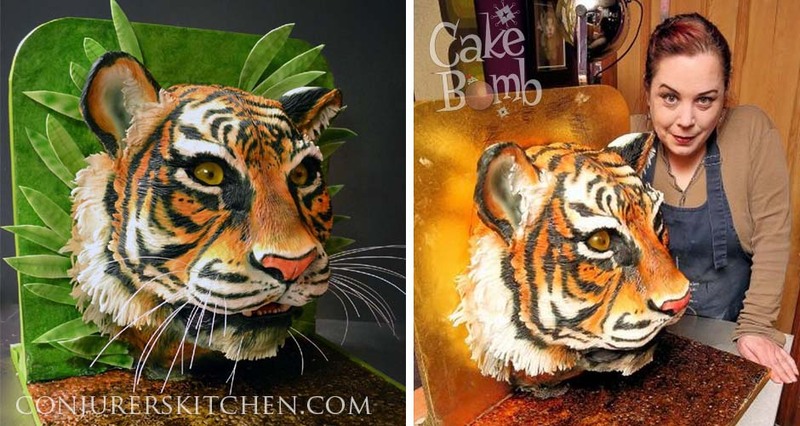 The cake is based on the beautiful Daseep, a stunning Sumatran tiger who is, unsurprisingly, the star attraction of the zoo. Oak Furniture Land commissioned CakeBomb to make a cake of the gorgeous Daseep to donate to the Zoo. Annabel, of Conjurer’s Kitchen, was thrilled to meet the real Daseep when she delivered the cake. We think you’ll agree that Annabel has created a beautiful piece of edible art for the Zoo. I wonder what Daseep the tiger would make make of it? Short work I imagine!